the savvy trader to capitalize on the feedback they provide and make huge profits. Typically, a useful technical analysis indicator should make it easy for you to predict the direction price movements will take. But to make good use of an indicator, you must first know how to set it up on your trading charts and read the signals it provides. 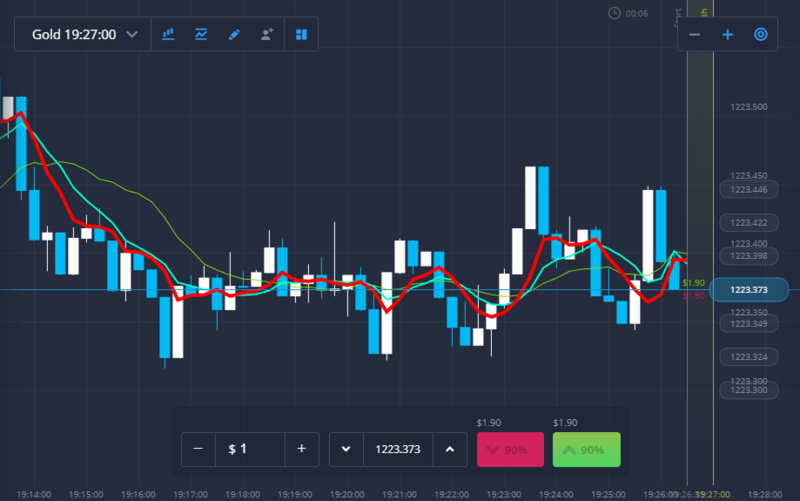 This guide will look at the moving average technical indicator when applied to the ExpertOption trading platform. 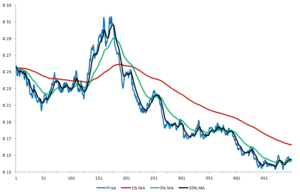 What is the moving average indicator? Which indicator type should you use? This indicator tracks price movements. Its main purpose is to show the average price of the asset at a certain moment. at candle 14 will be equal to the sum of the closing price of all 14 candles divided by 14. So when a new candle appears on your chart, a new moving average value will be displayed. Since moving average indicators track price changes, they are a great tool to use to predict the direction of the market. For example, if the average price is rising, you can comfortably predict an uptrend is imminent. This shows the average price over a specific period of time. weight while the farthest price is given the lowest weight. The average value is arrived at by adding the sum of current values to previous values simultaneously but taking into account available prices. The available prices are arrived at by using WMA. That it, only high weight values are added. It’s similar to SMA. The only difference is that SMMA values are smoothed out to get rid of random variations. I’ve found that many people tend to worry about the moving average type they should use as well as trying to memorize the formulas used to arrive at average prices. It’s a total waste of time. What I would advise you to do is learn how to read and use the signals provided by whatever moving average indicator you’re using. The moving average indicator can be used in many different ways. The simplest way however involves getting into position at points where the MA line cuts the price trend line. Using the chart above, you should enter a buy position when the moving average line cuts the price line from the bottom. That is, the moving average line moves from above the price movement line and shifts to below it. On the other hand, you should enter a sell position when the moving average line moves above the price movement line. Sometimes, getting a clear signal from one MA line can be difficult. This occasionally happens when false trends develop and you’re too quick to enter position. In such cases, you can use more than one moving average indicator on your chart. This allows you to easily determine when a trend is false and therefore avoid getting into unprofitable trades. In the next example, I’ll use 3 SMA lines with different time periods (7, 14, and 21) to illustrate this point. Now, when the uptrend begins, I’ll first wait for the price chart to cross the SMA (7) line. This will be the first signal that a trend is about to form. It’s still too early to enter position. So I’ll keep monitoring the price movement. If it rises above SMA (14) I’m now sure that there’s a trend developing. Most traders will enter position at this moment. However, I’ll usually wait until the price line crosses the SMA (21). Here, I’m quite sure of the price movement and confident that the possibility of false signals occurring is slim to none. One downside to using SMA signals is that they are respond quite slowly to price movements. As such, they are quite inefficient if you intend to make price predictions further into the future. Besides identifying possible near future price movements, moving average indicators can come in handy when determining support and resistance lines. Usually, you’ll determine where support and resistance lines form just by looking at where all three MA lines intersect with your price movement chart. Moving average is perhaps the simplest and most commonly used indicator for trend prediction. For short term trading, they are quite accurate and if used well, MA indicators will make it easier to predict profitable trends. 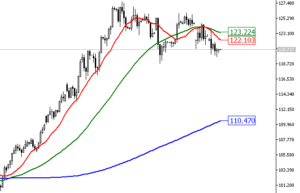 One of the good ways to use this indicator is by applying multiple MA lines with different intervals in your chart. This way, it gets easier to identify trends as well as support/resistance levels for trends. The major downside to using MA indicators is the occurrence of false signals. But as I illustrated in my example, using multiple MA lines can enable you accurately predict false and real signals.